Dept. of Pathology, Krishna Institute of Medical Sciences Deemed University (KIMSDU), Karad, Maharashtra, India. Abstract: Schwannomas are rare tumors which arise from nerve sheath and are mostly benign in nature. They are usually located in the head, neck and flexor surfaces of extremities. Schwannomas are very rare in the retroperitoneal region. Amongst all schwannomas 0.7% of benign ones and 1.7% of malignant ones are located in the retroperitoneum. Preoperative diagnosis is difficult because of vague symptoms. We report a case of retroperitonal schwannoma in a 70 years female patient because of its rarity and unusual location. Schwannomas (Neurilemomas, Neurinomas or perineural fibroblastoma) are benign tumors arising from nerve sheath of Schwann cells. The etiology is still unknown. (1,2) They usually affect adult patients in the age group of 20-50 years and are more common in males. (3) The usual location is in head, neck and on flexor surfaces of extremities, retroperitoneum being the rare site with the incidence being 0.3-3.2%. Retroperitoneal schwannomas account for 1-10% of all primary retroperitoneal tumors. (1) Majority of retroperitoneal schwannomas are benign in nature. We describe a case of incidentally diagnosed retroperitoneal ancient type schwannoma in a female patient because of its rarity and unusual site. A 70 years female came to medicine department with complaints of epilepsy and vomiting. Ultrasonography revealed a round to oval heteroechoic mass near the lower pole of right kidney in the paracaval region. Other investigations were normal. Exploratory laparotomy was done, mass was excised and specimen was sent for histopathology. Pathological examination: On gross examination it was a single, encapsulated, well-circumscribed, globular, grey white to grey brown mass measuring 7x6x4 cm. Cut section revealed a grey white to grey brown variegated appearance with cystic areas, hemorrhages and areas of calcification. Microscopically it was a well circumscribed, encapsulated tumor showing hypercellular and hypocellular areas. Elongated spindle shaped neoplastic cells showed tapering nuclei with nuclear palisading. Occasional area showed enlarged, hyperchromatic nuclei with very low mitotic activity. Areas of cystic degeneration, myxoid change and ossification were noted. 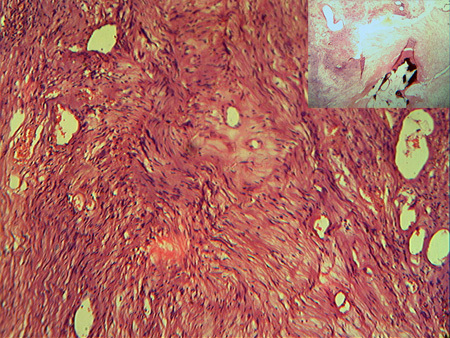 Figure 1: A well circumscribed tumour, cut section showing variegated appearance, cystic areas, hemorrhages and calcification. Retroperitoneal schwannomas are rare tumours and are usually detected incidentally after radiological examination. Neurological symptoms are rare. Few cases present with abdominal and lower back pain and digestive disturbances. The tumour is usually detected with pre-operative cross sectional imaging which reveals a solid mass in the retroperitoneum with a few cystic areas. Though ultrasound and computed tomography can detect the tumour, MRI allows better visualization and involvement of other organs. These radiological findings are usually non-specific and fail to give accurate diagnosis on most of the times. (4) Definitive diagnosis relies on histopathological examination of the tumour. CT guided biopsy can be attempted for preoperative diagnosis. Kapan M stated the limited role of this investigation due to the risk of hemorrhages, infection and tumour seeding. Grossly schwannomas are encapsulated, globoid masses of variable size. Retroperitoneal schwannomas are usually large tumors. Cut section is glistening. Ancient schwannomas show infarct like�necrosis, cystic changes, calcification and ossification related to degeneration. Aslan Y, Aydin AO, Tekdogan UY, Atan A. Retroperitoneal Schwannoma: A case Report Review of the literature. Journal of Neurological Sciences. 2010;27(3):353-358. Wong CS, Chu TYC, Tam KF. Retroperitoneal schwannoma: a common tumour in an uncommon site. Hong Kong Med J. 2010;16:66-68. Goh BKP, Tan Y, Chung YA, Chow PKH, Ool LPJ, Wong WK. 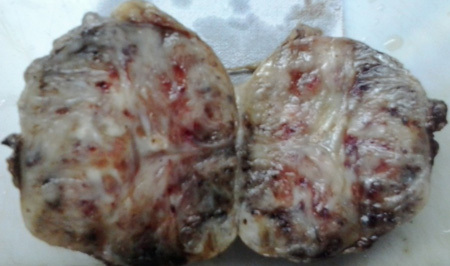 Retroperitoneal schwannoma. Am J Surg. 2006:192:14-18. Song JY et al. Schwannoma in the retroperitoneum. J Obstet Gynaecol. 2007:33;318-320. Louis DN, Ohgaki H, Wrestler OD, Cavenese WK. Tumors of cranial and paraspinal nerves in WHO classification of tumours of the central nervous system. IARC. 2007;151-160. Weiss SW, Goldblum JR. Benign tumours of peripheral nerves. In Enzinger and Weiss's Soft Tissue Tumors. 4th edition. A Harcourt Health sciences company. 2001. pp. 1111-1263. Kudo T, Kawakami H, Kuwatani M, et al. Three cases of retroperitoneal schwannoma diagnosed by EUS-FNA. World J Gastroenterol. 2011;17(29):3459-3464. Daneshmand S, Youssefzadeh D, Chamie K, Boswell W, Wu N, Stein JP et al. Benign retroperitoneal schwannoma: a case series and review of the literature. Urology. 2003;62(6):993-997. Li Q, Gao C, Juzi JT, Hao X. Analysis of 82 cases of retroperitoneal schwannoma. ANZ J�Surg. 2007;77(4):237-240.